Good morning! Are any of you familiar with the indie brand My Ten Friends? The brand kind of came out of left field for me and knocked me on my rear end. At first, I wasn't sure what to expect with the polishes, but as soon as I put them on it was like angels singing. Maybe that seems a little dramatic to you but dang it I really love these polishes! 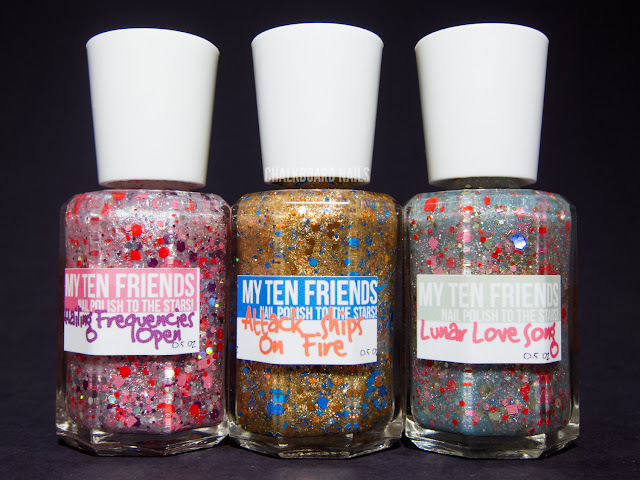 The three polishes we'll be looking at today are Hailing Frequencies Open, Attack Ships On Fire, and Lunar Love Song. My Ten Friends polishes come in a hexagonal bottle with these really cute coordinated labels. While I do love all three of these polishes, Hailing Frequencies Open is my favorite of the bunch. This stunning glitter mix has pink, red, silver, and plum glitters, plus a heavy dose of white/silver shimmer. You could probably build this one to opacity on its own, but in my opinion I think the shimmer in the base could be overpowering at that point. I chose to layer one coat of the polish over Nicole by OPI Am I Making Myself Claire and was thrilled with the outcome. Lunar Love Song was inspired by a dream the creator of My Ten Friends had of a green moon filled with cherry blossoms. Isn't that lovely? I wish my dreams were that pleasant; mine are more like 'you found a dried up turtle in your closet,' because yeah that makes sense (not). 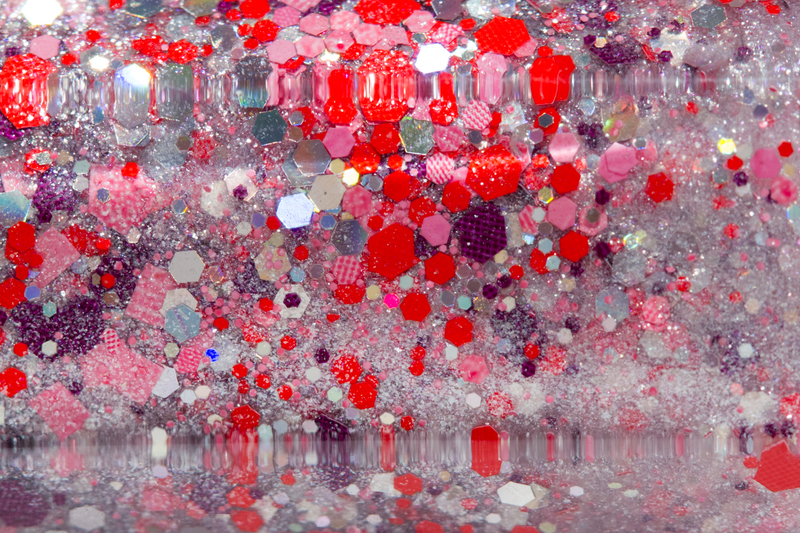 But back to the polish, Lunar Love Song is a gorgeous mint-aqua based shimmer with pink, red, and gold glitters. The color combination is stunning and I layered it over Pomegranate Lacquer Beach House to try to mimic the color of the shimmery base. I think this one would be harder to build up to opacity alone if you're that kinda gal. I prefer it layered! Attack Ships On Fire is a lovely mix of golds, blues and oranges. These blue glitters seem crazy bright and bold - I'm not sure if it's because of what they're in combination with or if it's just the way they are, but I like it! Shown here over OPI Don't Touch My Tutu. It's glam without being too glitzy, interesting without being too out-there. The formula on all three of these was great to work with. The polishes applied evenly and the glitter spread out nicely. I experienced no clumping, no glitter fishing, and no dragging issues. 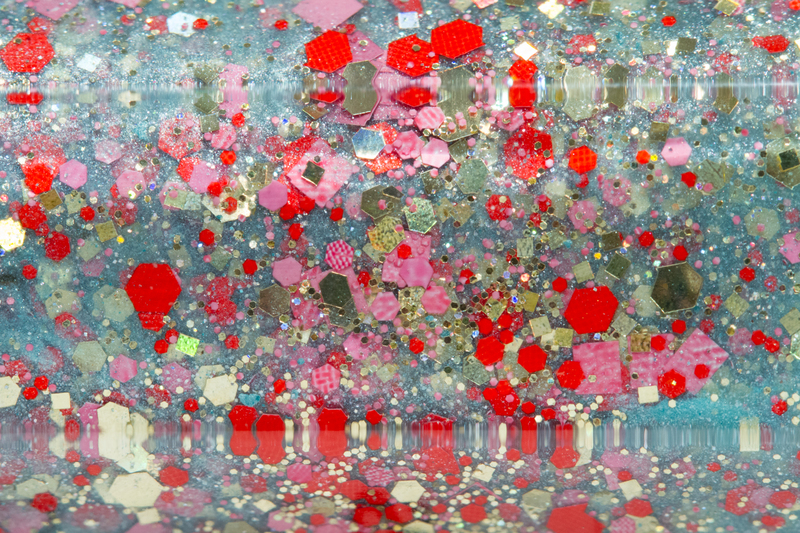 All three only required one coat for the glitter density you see in my photos. My Ten Friends polishes are sold on Etsy. There are still a few things in stock there, or you can keep up with the brand on Facebook and Twitter for news of restock dates and times. I'm sorry, I'm not sure what you mean. Could you clarify? Ohh, I see. Yes, unfortunately I took the manicure off last night. It was fun while it lasted though! Ah, when I just saw the pictures of bottles alone, I thought I wouldn't be excited about any of them. I knew I was so wrong when I saw your swatches! So in love with Lunar Love Song as well as Attack Ships on Fire! Absolutely stunning! Wow, these are great! Never heard of the brand before, but now I must have them! Hailing Frequencies Open is my favorite of the three but they are all stunning! That was hilarious about your dream about the dried up turtle, so funny! The polishes are stellar, and your swatches amazing, but unfortunately I hate those bottles. Don't get me wrong, the bottles are cute, but I have other polishes in those same bottles and they are *the worst* to open. Has anyone else found that? Oh wow, I am *really* impressed with this brand. 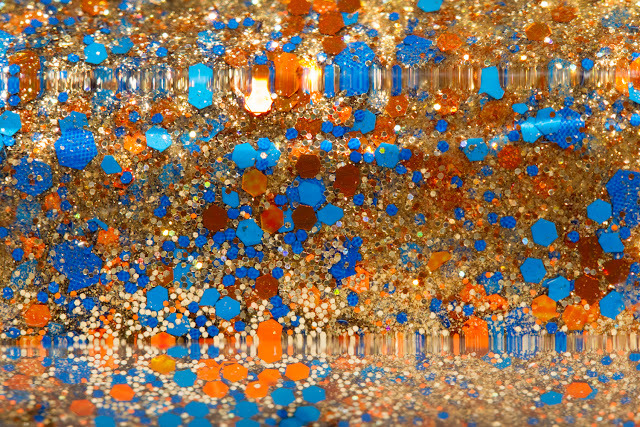 Re: the blue glitter in ASoF - since blue and orange are opposites on the color wheel, they make the other appear more vivid when together (same with green/red and purple/yellow). Since ASoF is mostly golden and orange, the blue glitter goes BLA-BLAMMM! And really stands out. These are gorgeous. I really love Lunar Love Songs and Hailing Frequencies. lovely! i love my ten friends. your swatches are super gorgeous. These look interesting! ASoF is most appealing to me - for the reasons explained above - I'm a colour-nerd too! I love My Ten Friends and your swatches are amazing!!! Lunar Love Song is gorgeous!! Passando para desejar uma ótima noite. oh man these are all gorgeous, especially the last one!! It's ok!!! Femme Fatale's (Aussie indie stockist) website says they are going to be stocking My Ten Friends soon! Yay! They didn't look like anything too spectacular in the bottles, but hot dang do they look good on the nail! Haha, your dreams sound like mine - last night I dreamt a pig with a machine gun was chasing after me, running on his little back legs... I feel your pain. I think I might *need* Attack Ships on Fire. Your swatches make it look awesome!! Attack Ships on Fire is gorgeous! I love it! My Nails Match My Wallet! OPI Mariah Carey Liquid Sand "Stage Shades"